It's winter and there is nothing better then curling up with a soft blanket next to a roaring fire drinking a nice hot cup of tea. Living in the south, it doesn't get that cold that often but when it does, it's absolutely, unbearably cold and you have to be prepared. 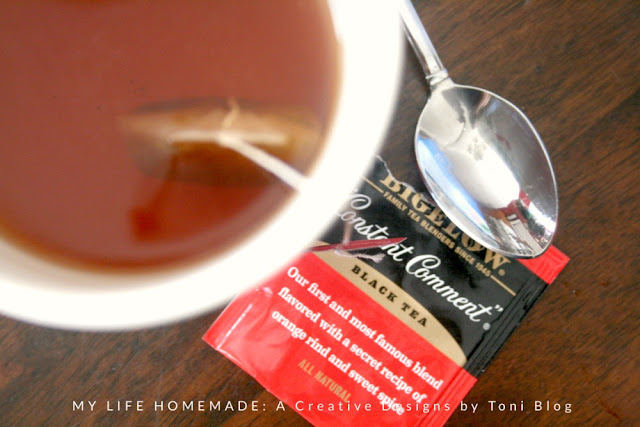 But, I don't just wait for the cold weather to hit before enjoying a steaming hot cup of my favorite Bigelow Tea. 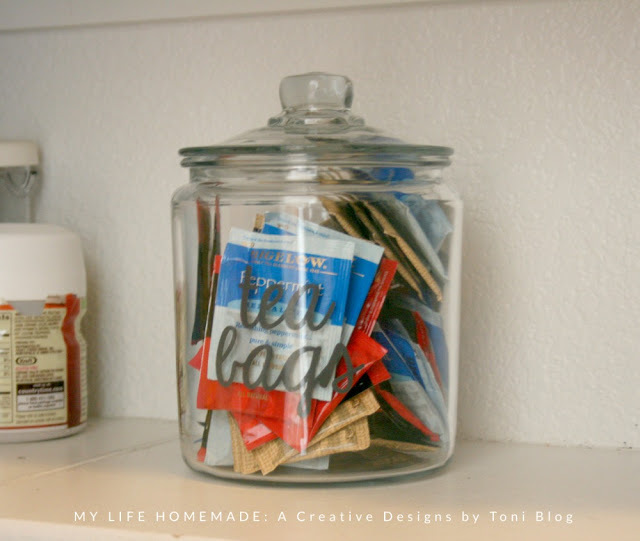 Because I am all about organization, I keep all my favorite flavors organized and stored in my pantry in a simple tea bag jar I created simply using a jar and decals. This way I have my choice of any flavor of tea ready on hand. I didn't always love drinking tea. It wasn't until a few years ago that hot tea came into my life. I was always an iced tea drinker. It was just something you did living in Texas. One winter night a few years ago by husband introduced me to the sweet deliciousness of hot tea and I was hooked!!! It took me a while to find the right tea and the right brand. Bigelow Tea did it for me and now I tea proudly! I enjoy trying new flavors and styles of hot tea. 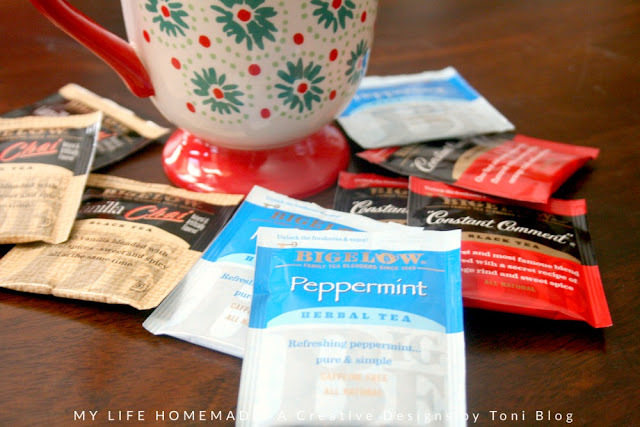 Bigelow Tea allows me to enjoy great flavors all year long. My favorite winter flavors are the Peppermint and Vanilla Chai. I recenly was able to taste Constant Comment and was blown away by the fantastic flavor. I think I found a new favorite. Did you know that tea is second only to water as the most consumed beverage in the world. Plus, 82% of Americans drink tea. That’s more than 158 million people who count tea as a top beverage choice. 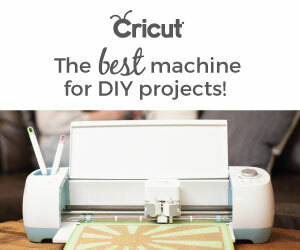 Who knew?!?! Also, drinking tea is so much more then just a drink. It’s a warm and soothing drink that connects people that may not have had the opportinity to do so before. 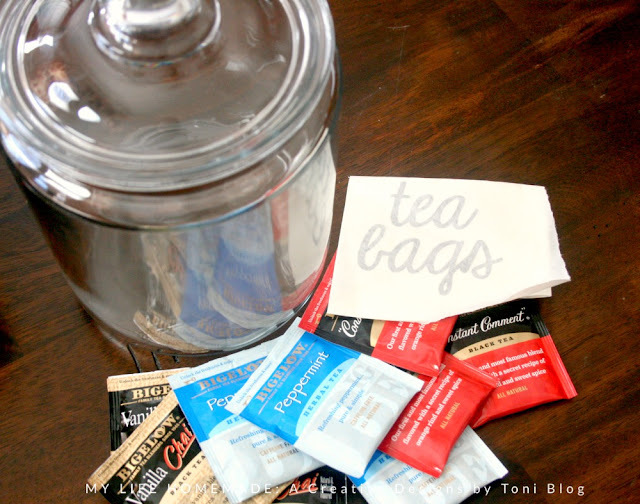 Now, I need to figure out how to keep and store all my new favorite tea bags in one place. I am trying to keep everything organized and neat for the new year, hopefully I can keep that up throughout the entire year. 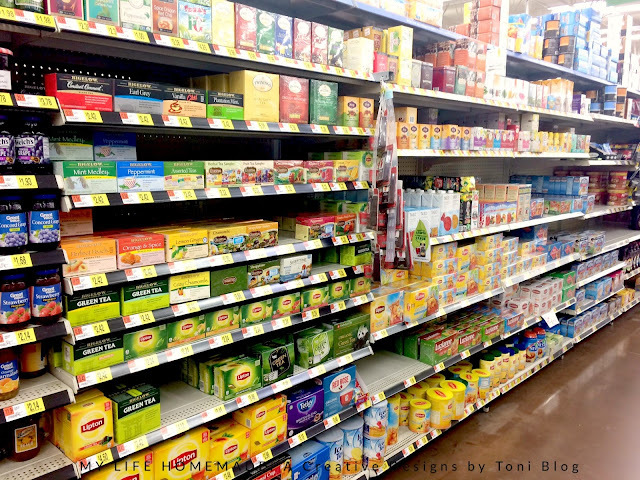 But, after shopping at Wal-Mart for my favorite teas, I searched the aisles for the perfect storage solution and I had a great idea. 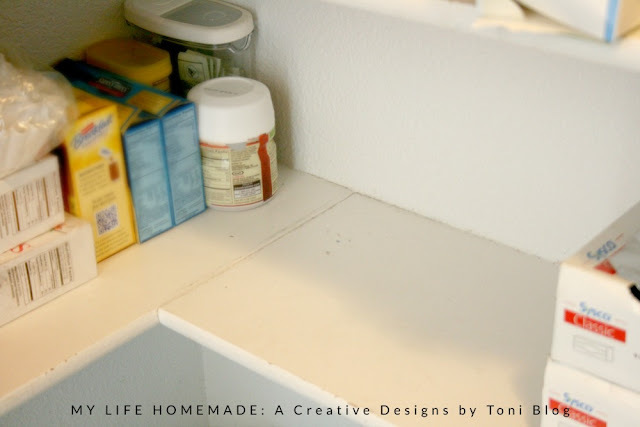 I had a perfect spot in my pantry that was screaming for something and for some organization. It was perfect to store my tea. I didn't want it just sitting in boxes on the shelf. I wanted it to be store proudly and ready to go. 1. Clean glass jar completely with glass cleaner and let dry. 2. 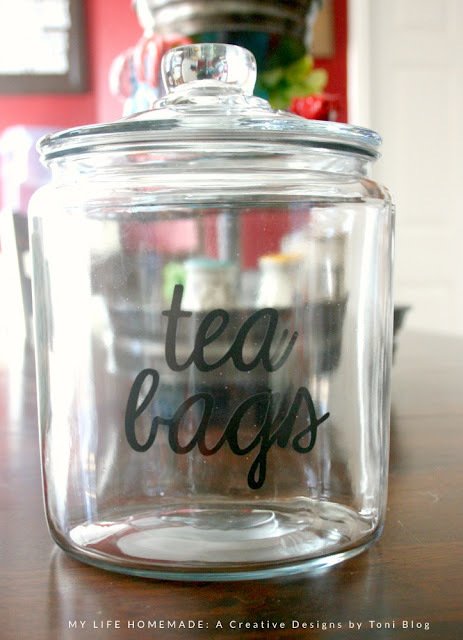 Apply decal to front of glass jar. 3. 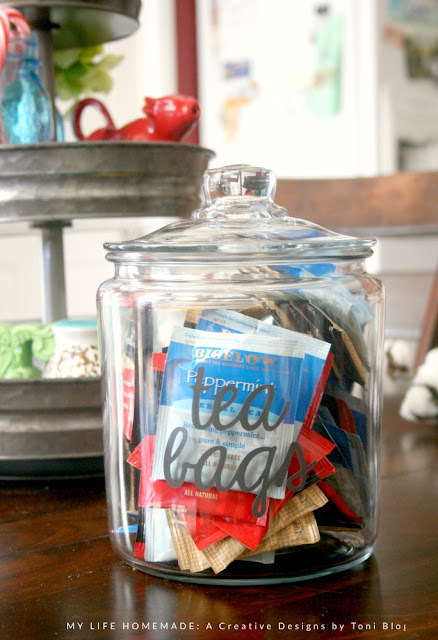 Fill jar with your favorite tea bags. 4. 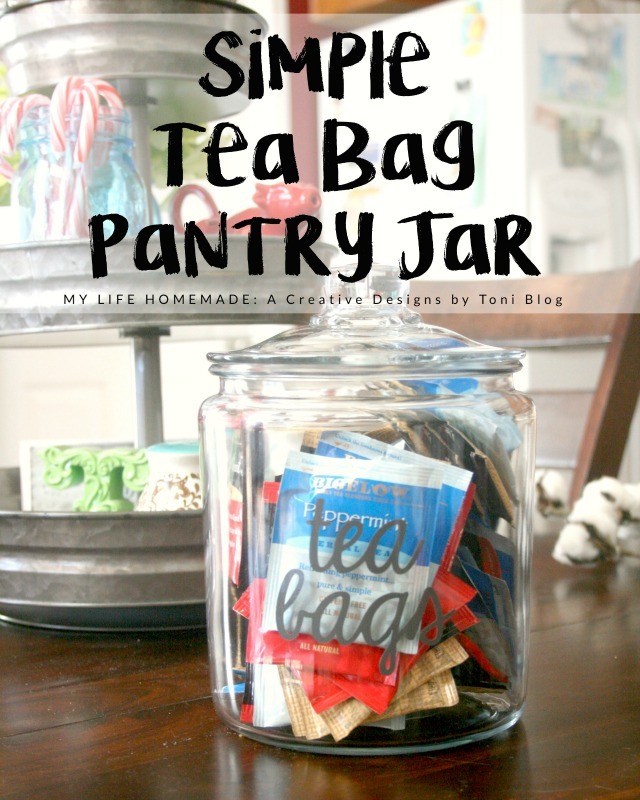 Place jar in pantry for easy access. 5. 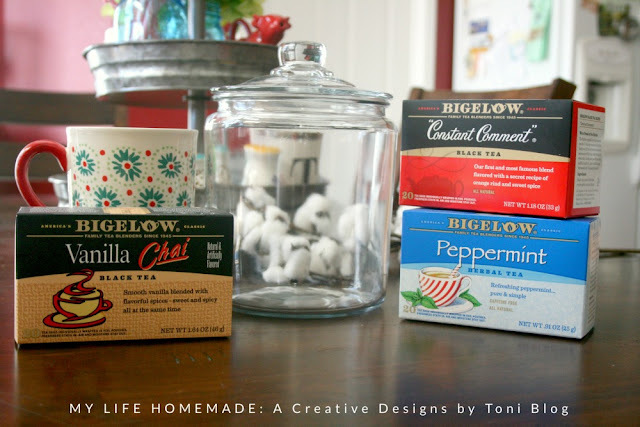 Enjoy a nice, hot cup of your favorite Bigelow tea. 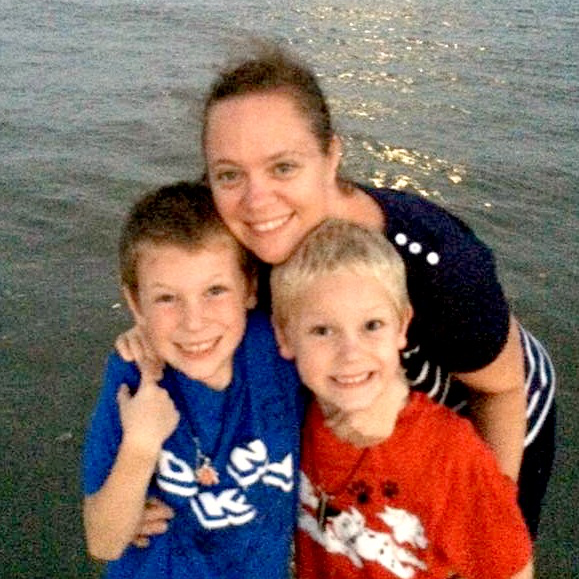 Enter the Ultimate Relaxation Getaway Sweepstakes sponsored by Collective Bias today!!! 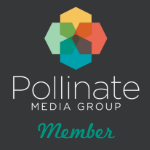 Tea proudly is a platform for tea drinkers, by Bigelow, to come out and make tea part of the conversation and share their passion for tea and how it is a part of their life. Stop by and share your love and passion for tea and don't forget that January is hot tea month and I want to see how you celebrate with Bigelow Tea! 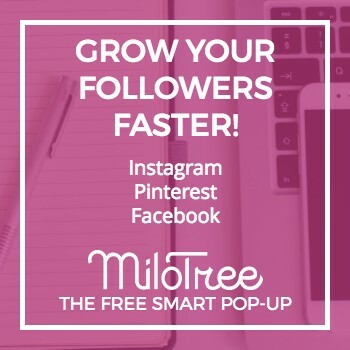 Head over to their facebook page, follow them on Twitter, and get great inspiration from their Instagram page.